Knotted-Thread: Retro Flowers finale? or not? I basted and pinned both my SHG quilt top and my granny squares quilt top this weekend.. no quilting progress to show, though I did get some done. I need thoughts and opinions.. for the Chasing Chevrons quilt top, how would you quilt it? I was thinking of dying some organic wavy lines, but then I really liked this chevron quilting (btw how amazing is that quilt). So, thoughts and opinions would be GREATLY appreciated - I'm trying not to take away from the quilt top with the quilting - the backing is a solid piece of blue fabric and I'm planning to use gray thread to quilt it.. Okay, onto the actual sewing this weekend. 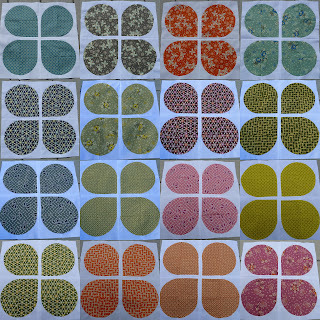 I finished 5 more of my Retro Flowers blocks bringing the grand total to 16! Excuse the lopsided pictures, it was starting to drizzle and I wanted to get the pictures taken during the brief pause in rain! When we laid it out on the floor I started thinking about how a 5x5 would look..
then I realized the Hope Valley line is 24 fabrics and I happen to have them all.. I'll give you one guess as to what I did next..
Man girl you were busy and ROCKED IT! Your retro flowers look great!! Lol, mine are definitely staying at 3 x 3. Good luck with the quilting of the chevrons, maybe quilt chevrons in the direction they're going? Sorry, my ideas when it comes to quilting are crap! I think I like the diagonal lines. I think using an organic wave might take away from the geometric top. WOW ! and I love the flower blocks, great fabric. I love that chevron quilt. I think diagonal lines as well. Oh man! 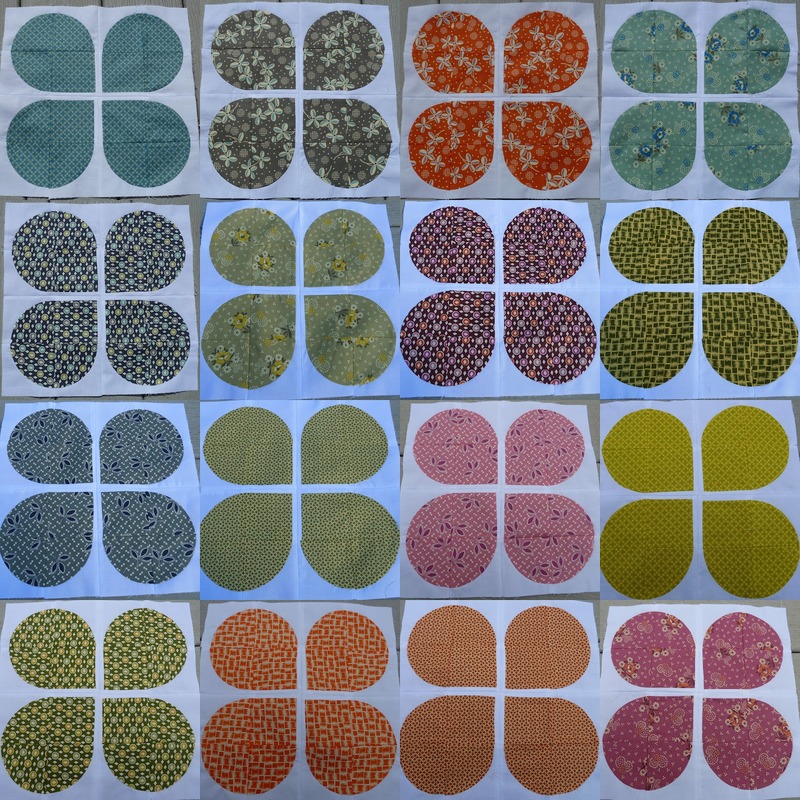 Your retro flowers quilt (in hope valley!) is going to be amazing! I have some hope valley stashed away for a swoon, but your's is starting to have me wish I had double yardage to make one of these. Looks like you were a busy little bee this weekend! I was going to say why not just quilt it with one big chevron, then I clicked over to your link. Sounds like a plan to me. Your retro flowers are looking awesome, too! 25 of those dudes sounds like a lot of work! Wow you got a lot done. Possibly go with echo quilting? Your retro flowers are WONDERFUL!!! Your retro flowers look amazing - can't wait to see the finish!